Rainforest swing by Fisher-Price is a bright and colorful baby swing that is easy to operate and comes with lots of features to keep the baby entertained when awake and relaxed while napping. The high quality frame is stable and safely hold the seat. It can be also easily folded for storage and transportation which makes this swing very portable and suitable to use even in small apartments. 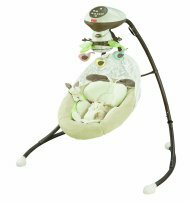 The rainforest swing offers several different speeds and songs as well as few other features that can be easily set using intuitive panel with clear markings. Swings from side-to-side and rocks from top to bottom. By using the control panel at the top of the frame I was able to easily select desired speed as well as sound and visual effects. Once my son was awake he really enjoyed faster rocking. The motor in this swing is powerful enough to efficiently move the seat with my almost 20 lbs kid without a problem. I was using this swing’s “entertainment” features when cooking or ironing to keep my boy occupied. They consists of a large, colorful and moving mobile and a set of 12 different songs and nature sounds. The mobile of this swing is really impressive. It has a mirror in the middle which turned out to be fascinating for my son. There are also green leaves on its side that move up and down and colorful plush toys that rotate. As the mobile has its own motor once turned on I don’t have to do anything and he is completely immersed in his private amusement park. If you want you can also accompany the rocking and magical movements of the mobile by some vivid sound from the build in music player. We don’t use them as he does not even notice the sounds once all the magical stuff happens above his head. Instead we both listen to my favorite radio auditions (at least I do). On the other hand I found the music player to be very useful when he’s tired and it’s time for a nap. Gentle rocking and the sound of rain works wonders in calming and relaxing him. I also fold the mobile up to remove the visual stimulation out off his sight. The seat is padded and covered with soft, nice in touch fabric which makes is comfortable for the baby. It also comes with a padded head support which can be easily removed for washing if needed. 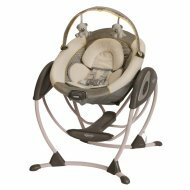 Two position seat recline helps the baby to observe the surrounding in more upright position as well as comfortable nap with deeper recline. Operating the rainforest swing thanks to the well thought out design is very easy. As the mobile can be lifted I am able to put my son in the seat as well as remove him from the swing without a problem. There is no risk of bumping the baby into the mobile or a need to execute some complicated maneuvers. To change a seat position, and thus switch from rocking from side to side to swinging from head to toe, all you need to do is to turn it around. This can be done with one hand and once the seat is in position the automatic locking mechanism keeps it safely locked. I found operating this swing to be fairly intuitive and despite not reading the manual I was able to control all the functions with no problems. 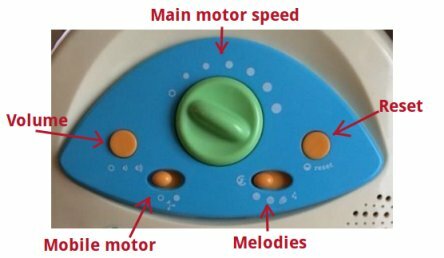 In the middle of the blue panel there is a green knob to turn the main motor on and off as well as for regulating the speed. On the left there is a yellow button to regulate the loudness. It has three positions: off, medium and loud (which is not really very loud). On its right there is a switch to turn on and off the mobile (both rotation and leaves movement). The next switch enables the selection of melodies. Those include calming music, vigorous music, sounds of a forest and sounds of rain. The last button is a reset to restart the melody. The control panel of this swing is one of the most intuitive panels among baby swings. 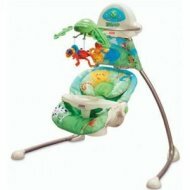 To see other devices see our comprehensive list of top baby swings. Sometimes the motor operates quite loud. To fix it just separate the legs farther apart and it will be quiet again. I found that if you keep the legs as far apart as possible there should be no problem. Either battery operated or with an AC adapter (included). The motor sometimes has problems to start swinging and with heavier babies you may have to give the seat a push to start.